beautiful. beautiful. : The "housewife" blog that went viral. The above description was used to describe a recent post Not a typical blog entry. Being a mom that is just trying her best to make sure lunches are packed, dinner is on, and my two year old doesn't let the dog out unnoticed, you can only imagine my shock when I saw over 10,200 (and still climbing) readers have opened my post. Staying out of politics, and being a preaching mom that tells her children to not put anyone down, I broke my own rules. Perhaps one of the many reasons I wrote and deleted it four times before sending, then waited hours before getting the nerve to hit publish. Today I am humbled beyond imagination as I re-read the comments and hundreds of shares it got. "....TRULY heartfelt reverence for "real" teachers . After reading this I felt uplifted and respected for the first the in a very long time." "I have been so discouraged over the last four years that I wish every day that I could quit after 18 years. It does my heart good to read things like this blog! Thank you for the support!" "Thank you for your words...as a public school teacher they give me hope..."
" Its uplifting to know that there are still people who value real education and truly put students first." "In the past four years, I have felt demeaned, belittled, and demoralized by our state's policies concerning education. Thank you. Thank you. Thank you." 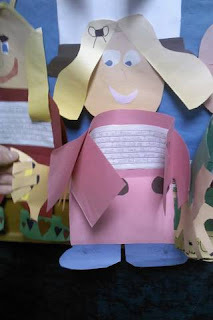 " I am a teacher in Northwest Indiana and I want to thank you for this blog. It gives me hope..."
" your words here and more importantly, your thoughts and efforts in constructing them have helped bring a glorious result"
Reading words from strangers of the hope this "housewife blog" gave them melts my heart. I am not the one to thank. The ones that get demeaned and degraded, yet still stand in front of students with a smile deserve all the applaud. I have made the choice to send my child to be in the care of teachers, public educators, and a very special bus driver for seven hours a day....the thanks be to all of you. Leave you with a couple pictures I took Monday as I volunteered in my daughter's school. The first is of a long bulletin board covered in the most precious artwork I have ever seen. Self portraits that when opened up have handwritten message from the artist stating what they want to be when they grow up. 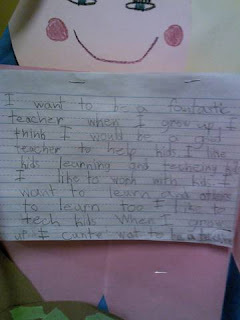 "I want to be a fantastic teacher....I like to work with kids...I like to teach kids." 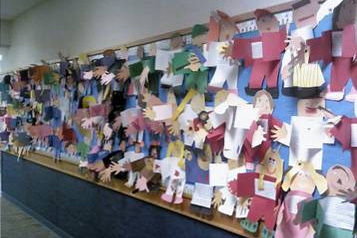 These artists are in first grade. None of them said they wanted to be marketing director for a pharmaceutical company. Of course, they want to be what they have experienced and what they know about. I find it amazing that despite the bullying teachers have received in regards to their profession, they are still able to stand up in front of a classroom day after day and make these positive impressions on their students. Wow. What a week. A plea for a few people to be informed and vote for people instead of a party, went way beyond it's expectations. (which by the way do we find it interesting that Ritz was originally a R and switched to D just to run? anyhow.....) Thank you to EVERYONE that shared, commented and sent such heart warming messages to me. - and what does she want to be when she grows up? An art teacher. So blessed to know this still can come true now.